Once again a very good read, thank you Bilgerat. What a story Bilgerat, HMS Monarch certainly had an active role in our naval history, Great reading. HMS Monarch was a Common Type, 74-gun, Third rate ship of the line of the Ramillies Class, built at the Royal Dockyard, Deptford, at the time in the County of Kent. The ship was to go on to have an action-packed career. The Ramillies class were a group of 9 third rate ships of the line, of which six were built in Kent shipyards, four of them at the Deptford Royal Dockyard. A further ship was built under contract by Thomas West, also at Deptford, with the lead ship of the class built at the Chatham Royal Dockyard. They were designed by Sir Thomas Slade, Co-Surveyor of the Navy and were an improved, slightly enlarged version of his previous Bellona class, the lead ship of which was the Chatham-built prototype of the 'Common' type of 74 gun ship. The Common Type of 74 gun ship was by far the most numerous of the Royal Navy's ships of the line from the mid 1750's up until the early 19th century. HMS Monarch was ordered from the Deptford Royal Dockyard on Saturday 22nd November 1760, at a time when the Seven Years War against France was at it's height. A month after the order was placed, the Admiralty ordered that the new ship, until then just a hull number, was to be called 'Monarch' and her keel was laid at Deptford on Tuesday 2nd June 1761. The Seven Years War ended in February 1763 with the signing of the Treaty of Paris. Since the war for which the ship had been ordered was now over, construction of HMS Monarch proceeded at a slower pace and the ship wasn't launched until Saturday 20th July 1765. In common with shipbuilding practice at the time, the ship's hull was fully complete when launched and only required guns, masts and rigging to be fitted and stores to be loaded for her to be ready for sea. When completed, HMS Monarch was a ship of 1,612 tons, she was 168' 5" long on her upper gundeck and was 46' 10" wide across the beam. The ship was armed with 28 32pdr long guns on her lower gundeck, 28 18pdr long guns on her upper gundeck, 14 9pdr long guns on her quarterdeck and 4 pdr long guns on her forecastle. She was manned by 550 officers, men, boys and marines. By the time the ship was fully complete, she had cost £34,407,19s,10d. What happened after the ship was launched is unclear. The ship underwent repairs at Portsmouth between July 1773 and April 1774, which cost £8,559,18s,8d. From 1773, protests in the American colonies over taxation had been escalating towards an armed rebellion, which broke out in 1775. In early 1776, France and Spain began sending aid to the rebels in the form of arms, naval ships and crews operating under American colours as privateers as well as what would today be called 'Military Advisors'. On July 4th 1776, the American rebels formally declared themselves to be independent of the British crown and a British invasion of the colonies from Canada was defeated in two battles at Saratoga in September and October 1777. These rebel victories persuaded the French to openly intervene in the war, which they did from early 1778. It was against this background that HMS MOnarch was fitted for sea between June and October 1777 and commissioned under Captain Sir Joshua Rowley. She joined the Channel Fleet, then led by Admiral Augustus Keppel, flying his command flag in HMS Victory (100). HMS Monarch was assigned to the Vanguard Squadron, led by Vice-Admiral Sir Robert Harland in HMS Queen (90). On 23rd July 1778, the fleet sighted a French fleet of 29 ships of the line west of Ushant, off Brest. 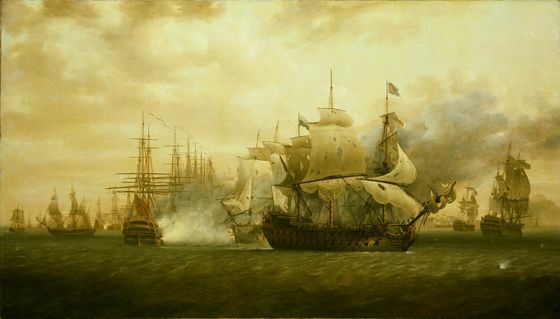 In poor weather, HMS Victory was the first to engage the enemy, opening fire on the French flagship Bretagne, 110 guns. The action which followed became known as the First Battle of Ushant and ended indecisively, with the British driving off the French but suffering heavier casualties. The indecisive result of the battle caused a violent political quarrel in the UK which led to Keppel being court-martialled for dereliction of duty but found not guilty and resigning from the Navy temporarily. In December 1778, HMS Monarch received a new commander, Captain Sir Adam Duncan. Duncan was a giant of a man by the standards of the day, standing 6'4" tall at a time when the height of the average adult male was only 5'6". He would later come to fame as the victor at the Battle of Camperdown. The fallout from the poor performance of the Channel Fleet at the Battle of Ushant was not yet over and Captain Duncan was asked to sit on the Court Martial Board trying Admiral Keppel for dereliction of duty. Duncan made himself unpopular with the Admiralty by repeatedly challenging the prosecutor at Keppel's Court Martial and ordering him to stop asking irrelevant and misleading questions and then twisting the answers. In the end, Keppel was found not guilty. The Admiralty, keen to prevent a re-occurrence of this in the following Court Martial of Vice-Admiral Sir Hugh Palliser for disobedience of orders during the same battle, attempted to prevent Duncan sitting on that Court Martial by ordering HMS Monarch to the anchorage off St Helens, Isle of Wight. HMS Monarch's crew had still not yet been paid, so refused to weigh anchor until they had. This enabled Duncan, against the Admiralty's wishes, to sit on Palliser's Court Martial also. Palliser was also found not guilty and in addition, the Court Martial Board found that the charges against Palliser were unfounded and had been brought maliciously in pursuance of the feud between Keppel and Palliser which followed the battle. On 8th January 1780, HMS Monarch was still part of the British Channel fleet, now under Vice-Admiral George Rodney, flying his command flag in the 100 gun 1st rate ship HMS Royal George. On that day, the Channel Fleet attacked and seized a Spanish convoy in it's entirety in what is known as The Attack on the Caracas Convoy. One of the Spanish warships captured, the 64 gun ship Guipuzcoana was renamed HMS Prince William on Rodney's orders, in honour of Prince William (later King William IV) who participated in the action. 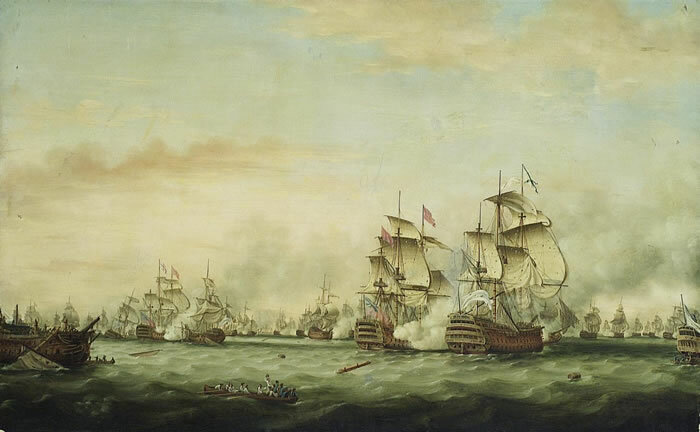 Eight days after the Attack on the Caracas Convoy, HMS Monarch participated in the Battle of Cape St Vincent (1780) as part of Rodney's fleet. This battle was unusual because it took place at night and is sometimes known as 'The Moonlight Battle'. It was the first outright victory for the British in a major, set-piece naval battle over their European enemies in the American War of Independance. The battle was also significant because it proved the benefits of the then new British practice of sheathing ships bottoms in copper. It was an overwhelming victory for the British, capturing six Spanish ships and destroying one out of a total Spanish fleet of 13 ships. The 'Moonlight Battle' of cape St Vincent. Three days after that, on 19th January 1780, HMS Monarch was still part of Rodney's Channel Fleet and took part in the First Relief of the Great Seige of Gibraltar. The Great Seige of Gibraltar lasted from 24th June 1779 and lasted until the end of the war in February 1783. It remains the longest seige ever endured by British forces. In October 1780, HMS Monarch received a new commander, Captain Francis Reynolds, who was to remain in command for the next seven years. On Thursday 26th October 1780, HMS Monarch sailed for the West Indies. By this time, the Fourth Anglo-Dutch War had broken out. This was was brought about by the refusal of the Dutch Republic, Britain's main ally at the time, to stop trading with both France and the rebel Americans. Once the American War of Independence had broken out, the Royal Navy began to blockade those American ports not under British control. This naturally made it difficult for goods destined for the rebels to be shipped directly across the Atlantic. The Dutch controlled island of St Eustatius, already an entrepot, or distribution hub for goods coming across the Atlantic from Europe assumed a greater importance and thus became a critical source of supplies for the rebels. It's harbour was full of American merchant ships. Rodney had reported his anger at the fact that goods destined for the rebels had been brought across the Atlantic in convoys protected by British warships. The government agreed and issued orders that St Eustacius be seized almost as soon as the war with the Dutch broke out in December 1780. Rodney was ordered to seize the island in conjuction with an Army force led by General John Vaughan with some 3,000 men. The invasion force including HMS Monarch left St Lucia on 30th January 1780 and arrived at St Eustatius on 3rd February. Rodney quickly ordered his ships into position to neutralise the defences but instead of opening fire and launching the assault, he wrote to the Dutch governor and suggested that he surrender to avoid unnecessary bloodshed. Fortunately, Johannes de Graaf, the Dutch governor, agreed and the island surrendered. What happened following the capture of the island was controversial. 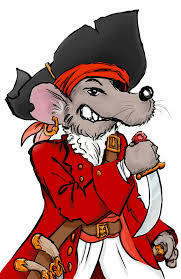 Some people accused Rodney (who at the time had a reputation for an obsession with prize-money and nepotism) of plundering the island. Even Rodney's second-in-command, Sir Samuel Hood, stated that he felt Rodney should have spent less time sorting through and valuing the confiscated property and should have gone after the French admiral the Compte de Grasse, who had arrived in the Caribbean with a fleet. Whatever the rights and wrongs of what happened during the capture of St Eustatius, in August of 1781, HMS Monarch was ordered to leave the Caribbean and join forces blockading the rebel-held towns and ports on the American coast. In the meantime, Rodney, whose health had never been that robust, had fallen ill and had returned to the UK to recover. His place was taken by Admiral Sir Thomas Graves. During the early months of 1781, a British army under the command of General Charles, the lord Cornwallis, had been successfully campaigning in Virginia, driving the rebels, led by General George Washington and their French allies, led by General the Compte de Rochambeau, south. Considering that the main British bases were in Philadelpia and New York, this had left Cornwallis' supply lines too stretched, so he had received orders from the Commander-in-Chief, General Sir Henry Clinton, to establish a deep water port on the Virginia coast. Following his orders, Cornwallis moved into the town of Yorktown, at the head of Chesapeake Bay and his soldiers began to fortify the town. Both sides in the war realised that with the British fortifying Yorktown, control of Chesapeake Bay was vital. The British were aware by now that de Grasse was loose in the area with a fleet and were concerned that he would try to secure the entrance to Chesapeake Bay. Sir Samuel Hood was detached with a squadron of 14 ships of the line to search for de Grasse. Hood arrived at Chesapeake Bay on 25th August 1781 and found nothing there, so decided to sail on to New York. On arrival at New York, he found Graves and the rest of the fleet there having failed to intercept a large convoy known to be bound for America from France full of supplies and hard currency for the rebels. On 27th August, a French fleet comprising of 8 ships of the line, 4 frigates and 18 transport ships carrying seige equipment, troops and heavy field guns left Newport bound for the Chesapeake Bay. News of this reached Graves in New York on 31st and he immediately sailed to intercept the French force. Graves had correctly guessed that the French were on their way to Chesapeake Bay. The two fleets sighted each other at 9.30 am on 5th September 1781. The French had got there first. HMS Monarch was part of the Vanguard Squadron of the British fleet, led by Sir Samuel Hood in the 98 gun 2nd rate ship HMS Barfleur. HMS Barfleur was commanded by Captain Alexander Hood, younger brother of Sir Samuel Hood, the fleet's second in command. Graves realised his only chance of success was to force his way into the Bay, past the French who were coming out to meet him and destroy the transport ships unloading near Cape Henry. Due to the way the various squadrons of the British fleet had manoeuvred into position prior to the battle, the Vanguard division found itself bringing up the rear of the British fleet as the lines of battle came into contact with each other. Many of the British ships were in poor condition, not having been near a dockyard in years. In addition, Graves caused confusion in his own fleet by sending conflicting signals. The result was that as the British captains and divisional commanders attempted to follow Graves' signals, the front and centre of the British fleet was heavily engaged and suffered severe damage against the superior French force while the rear division, including HMS Monarch did not engage at all. The Battle of Chesapeake Bay itself started at about 16:00, the delay was caused by Graves' insistence on his fleet getting into their proper formation before engaging. At sunset, the fighting ceased. Neither fleet had gained an advantage, other than the fact that the French were in the Bay and controlled it, whereas the British were not. On the night of the 6th September, Graves had a conference aboard his flagship with his divisional commanders, Hood and Drake. Hood and Graves, by all accounts, had a sharp exchange of words over the issue of the conflicting signals and Hood proposed that the fleet just sail past the French, straight into the bay. Graves rejected this plan and the British fleet continued to sail aimlessly to the eastward, away from Yorktown. On 11th September, Graves ordered that HMS Terrible (74) be scuttled as she was too badly damaged to continue. On 13th September, Graves learned that the French fleet was back in Chesapeake Bay and decided to give up attempting to force his way into the bay. On 20th September, the battered British fleet arrived back in New York. Although the Battle of Chesapeake Bay was indecisive in itself, the British failure to eject the French from Chesapeake Bay was to have profound and disastrous effects on the rest of the war. Yorktown had been encircled by the Americans and their French allies. With the Royal Navy unable to resupply him from the sea, Lord Cornwallis was faced with a stark choice - starve, along with his army and the inhabitants of Yorktown or surrender. On 17th September, Cornwallis wrote to General Clinton "if you cannot relieve me very soon, you must be prepared to hear the worst". On 19th October, Graves left New York again with a fleet of 25 ships of the line and a fleet of transports carrying 7,000 soldiers. On arrival off Chesapeake Bay, he found to his horror that he was two days too late. Cornwallis had surrendered to George Washington and the Compte de Rochambeau on the day he had left New York. The surrender of Cornwallis and his army at Yorktown left the British position untenable. With insufficient troops left to defend New York and Philadelphia, they were forced to abandon those cities and the loyalist communities in them to their fate. With the war ashore in North America now lost, HMS Monarch and the rest of the fleet made their way back to the Caribbean, as the French were not finished yet. Hood had replaced Graves in command as a temporary measure until Rodney could return to his command. In January 1782, de Grasse had taken his fleet back to the Caribbean and had attacked the British held islands of St Kitts and Nevis. The French had landed 6000 soldiers and had laid seige to the fortress on Brimstone Hill on St Kitts. Hood, having learned of this, immediately sailed to St Kitts, with 22 ships of the line, including HMS Monarch. At daybreak on 25th January 1782, the British sighted the French fleet, consisting of 26 ships of the line including de Grasse's flagship, the enormous Ville de Paris of 110 guns. Hood ordered his ships to steer as if to engage the French, but this was in fact, a feint. No sooner had the French fleet formed their lines of battle than Hood ordered a change of course, straight into the Bay, where his ships anchored in a defensive 'L' formation across the mouth of Frigate Bay. The Compte de Grasse, realising that Hood had outmanoeuvred him, made three attempts to force an entrance to Frigate Bay over the course of 26th January, all of which were successfully repulsed by Hood's force. The British ships were relatively undamaged, whereas the French force suffered damage and casualties with each attempt. HMS Monarch suffered two dead and two wounded during the Battle of St Kitts, also known as the Battle of Frigate Bay. Hood's force stayed in place for two weeks, but their success in keeping the French out of Frigate Bay was not enough to prevent the fortress on Brimstone Hill falling to the French on 12th February. Hood ordered his force to set sail from Frigate Bay on 14th. Battle of Frigate Bay, 26th January 1782. In February 1782, Rodney returned to his command, having recovered his health and used his political connections to successfully defend himself in a Parlimentary enquiry over the events at St Eustacius. Fresh from their success at St Kitts, the French returned to their base at Martinique and began to lay plans to seize Jamaica from the British. Rodney, now back in command sent his frigates to scour the Caribbean to discover de Grasse's intentions and it wasn't long before these became clear. If the British were expelled from Jamaica, they would find it very difficult to defend the rest of their possessions in the Caribbean and would probably, over time, be driven from the area altogether. On 7th April 1782, de Grasse set out from Martinique with 35 ships of the line with a convoy of 100 transport ships with the intention of meeting up with a Spanish squadron of 12 more ships of the line and 15,000 soldiers and launching the operation against Jamaica. On sighting the French force, Rodney and his fleet gave chase and four British ships of the line caught and dismasted the French 74 gun ship Zele. de Grasse attempted to assist the stricken ship and both fleets formed lines of battle. As the two fleets came alongside each other and opened fire, a change in the wind allowed the British to break through the French line, the first time the Royal Navy had tried this innovative tactic. This led to confusion and disorder in the French line and many of their ships were severely damaged, including the flagship, the 110 gun Ville de Paris. The French line was cut in two and a general chase developed. This action, on 12th April 1782 is now known as the Battle of the Saintes. HMS Monarch suffered more casualties at the Battle of the Saintes, losing 16 killed and 33 wounded. On 17th, Rodney ordered Rear-Admiral Samuel Hood to give chase to the remaining French ships and they caught up with the enemy on 19th. In the Battle of Mona Passage, the Chatham built HMS Valiant captured the French 64 gun ships Jason and Caton at the cost of 4 dead and 6 wounded. The two captured ships were taken into the Royal Navy. Jason was renamed HMS Argonaut and served until 1831 when she was broken up. Caton was used as a hospital ship for prisoners of war off Saltash, Cornwall. The Battle of the Saintes, 12th April 1782. The Battle of the Saintes ended French ambitions in the Carribean. The French had lost four ships of the line captured and one destroyed. de Grasse's flagship, the mighty Ville de Paris was one of those captured and to add insult to injury, de Grasse himself was taken prisoner. He was amongst some 5,000 French sailors taken prisoner in addition to some 2,000 dead or wounded. Rodney himself made sure he took full credit for the victory and on his return to the UK after the war was richly rewarded, including the award of a Baronetcy. Hood was also made a Peer. Part 2 - Peace, Back to war, Invasion of the Cape Colony, The Battle of Camperdown, the First Battle of Copenhagen, Hood's Action off Rochefort - 25th September 1806 and fate. HMS Monarch remained in the Caribbean until September 1782 until she was reassigned to Halifax. The war ended in 1783 with the signing of the Treaty of Paris. It had been a disaster for the British with the North American colonies having been lost. It had been a close-run thing in the Caribbean and in India. In early 1787, HMS Monarch returned to the UK and entered the Royal Dockyard at Chatham in August of that year in order to undergo a major refit and repair. This work would have amounted to a virtual rebuild of the ship. She would have emerged from it in an almost new condition. In January 1790, the work was complete. It had cost more than it had cost to build the ship in the first place, at £36,469,14s,1d. 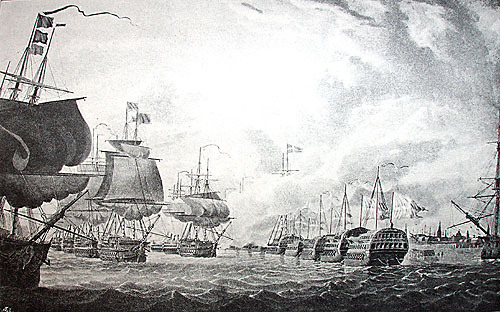 June and July 1790 was spent fitting for sea as a part of the British response to the Spanish Armaments Crisis and commissioned under Captain Peter Rainier. Fortunately, this was resolved peacefully and HMS Monarch paid off into the Ordinary at Chatham in September 1791. While HMS Monarch was undergoing her 'Great Repair', the French Revolution occurred. Although it was inititally supported by the British, who hoped that it would lead to the establishment of a Constitutional Monarchy on the lines of our own, the British did not entirely trust the Revolutionary Government in France. Steps were taken to increase the level of readiness of the Fleet. HMS Monarch was fitted for sea between December 1792 and January 1793. She commissioned under Captain Sir James Wallace. In February 1793, the Revolutionary Government in France declared war on Britain. On 24th March 1793, HMS MOnarch departed Chatham bound for the Leeward Islands in the Caribbean. Captain Wallace was replaced in command on 12th April 1794 by Captain Frank Sotherton. Her time in the Leeward Islands was uneventful and in April 1795, she sailed from there to the Cape of Good Hope. The reason for this was that in early 1795, France invaded and conquered the Seven Provinces of the Netherlands, mother country of the Dutch East India Company, which controlled the Cape Colony at the time. In order to prevent the French from using their control over the Company's homeland to restrict British trade and shipping movements, the British decided to seize the colony. In April 1795, HMS Monarch became flagship of Vice-Admiral Sir George Elphinstone, who commanded a force of 6 ships of the line, a frigate and 2 sloops. At the time that Elphinstone hoisted his command flag in HMS Monarch, Captain Sotherton was replaced in command by Captain John Elphinston. Captain Elphinston was an experienced senior Captain, who had commanded HMS Glory (98) at the Battle of the Glorious First of June the previous year. The British force arrived off Simons Town in early June. Vice-Admiral Elphinstone wrote to the Dutch governor and suggested that he place the colony under British protection, effectively handing the territory over. This was refused, so on 14th June, a force comprising 350 of the squadron's Royal Marines, plus 450 men of the 78th Highlanders were landed and occupied Simon's Town. Although the British controlled the main town in the colony, the Dutch militia's still controlled the surrounding area from their base at Muizenberg, from where they could harrass the British force. It was agreed by Vice-Admiral Elphinstone and General James Craig (commanding the land force) that the infantry should be reinforced by 1,000 sailors taken from the ships in the squadron. These were organised into two battalions, each of 500 men. One was under the command of Commander Temple Hardy of HMS Echo (16) and Commander John Spranger of HMS Rattlesnake (16). The naval force was deployed to boats from every ship in the squadron, which were also fitted with carronades taken from ships to serve as close-range artillery support. On 7th August, the two sloops in company with HMS America (64) and HMS Stately (64) made their way along the coast towards Muizenberg with the ships boats and commenced a highly effective bombardment of Dutch positions. The campaign lasted until 16th September, when the Dutch finally surrendered. Losses were remarkably light on both sides. In all, the British lost 34 dead, of whom only 8 were killed in action. The rest died from disease. This relatively minor battle in which the men of HMS Monarch participated is actually highly significant. Although the Cape COlony was returned to the Dutch under the Treaty of Amiens which ended the war in 1802, it was retaken in the Napoleonic war in 1806 and formed the springboard from which the British went on to colonise Africa. The newly conquered Netherlands, now called the Batavian Republic, launched an expedition to retake the Cape Colony from the British. A force of 9 Dutch ships, including three ships of the line was sent, under the command of Rear-Admiral Engelbertus Lucas. This force arrived in Saldanha Bay off the Cape Colony on 6th August 1796. The British had been expecting the Dutch force and when news of their arrival reached General Craig and Vice-Admiral Elphinstone, they immediately made their way to the Bay to confront the Dutch force. Craig arrived with 2,500 troops and 9 heavy field guns. Elphinstone's force was prevented from entering the Bay by the weather until 16th August but when conditions became favourable, Lucas found himself trapped. The British naval force was far superior to his own and he surrendered without firing a shot. All 9 of the Dutch ships were taken into Royal Navy service, as were the crews of the Dutch ships, most of whom were actually German anyway. HMS Monarch was to remain in South African waters until she returned to the UK and entered the Royal Dockyard at Portsmouth for a refit in August 1797. The work was completed quickly and the ship recommissioned under Captain Edward O'Bryen. She became flagship of Vice-Admiral Richard Onslow and was assigned to the North Sea Fleet under her former commander, now Admiral Sir Adam Duncan. HMS Monarch was unaffected by either of the Great Mutinies which had occurred earlier that year. While the mutiny at the Nore was underway, the Dutch fleet was making preparations to break out and join the French fleet at Brest. Admiral Duncan was ordered to immediately blockade them and ordered his ships to set sail for the coast of Holland. All but two of his ships disobeyed the order and joined the mutiny. Nevertheless, Duncan set to his task with the handful of ships available to him and by a mixture of subterfuge and luck, kept the Dutch bottled up in Texel. While Duncan was at sea, the mutiny at the Nore fell apart and he was joined by more ships. In October 1797, news reached the Admiralty that the Dutch had called off their plans to break out and the fleet was recalled to Yarmouth to refit and resupply. On 8th October however, the Dutch fleet under Admiral de Winter did indeed break out. They were followed by ships Duncan had left behind to watch them. On receiving the news, Duncan immediately ordered his ships to sea and by mid-day on 9th October, Duncan was at sea with 11 ships of the line, heading to intercept the Dutch as they headed south down the North Sea. More ships put to sea at they became ready, so that by 11th October, Duncan had 18 ships of the line available to him. 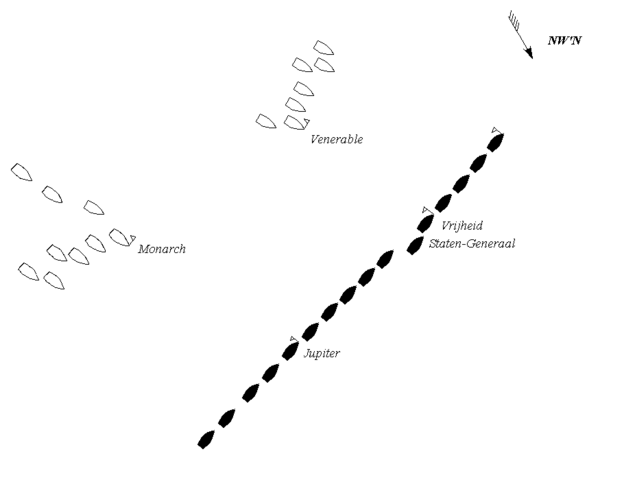 Duncan's plan was to follow that of Lord Howe at the Glorious First of June, that was to break through the enemy's line of battle, with each ship passing between two enemy vessels and raking them through their bows and sterns before turning and each ship then engaging a single enemy ship. The Dutch had turned and were heading towards the land, hoping to lure the bigger British ships into shallow water where the smaller Dutch ships would have the advantage. Duncan guessed that this was what they were up to and ordered his ships to engage the enemy as best they could. This led to the British fleet splitting up into two uneven divisions as per the map above. HMS Monarch was flagship of the Leeward division. At 12:05, the Dutch fired the opening shots in the Battle of Camperdown, with the Dutch ship Jupiter engaging HMS Monarch. Onslow's force managed to isolate the Dutch rearguard and by 13:45, Jupiter, Haarlem, Alkmaar and Delft had all surrendered. Things were more evenly matched in the northern part of the Dutch fleet with all Duncan's ship's engaged in single-ship actions against their Dutch opponents. With the rearguard mopped up, Onslow ordered his ships to head north and assist Duncan's force. HMS Director (64) was quickest to respond, along with HMS Powerful (74). By 15:00, all but the Dutch flagship, the Vrijheid had either fled or surrendered. The Dutch flagship was eventually forced to surrender by Captain William Bligh (of HMS Bounty fame) in HMS Director (64). British casualties in the Battle of Camperdown were unusually heavy. This was because the Dutch followed the British practice of firing into the hulls of enemy ships to cause maximum casualties before closing and boarding. As flagship of the Leeward division, HMS Monarch was engaged for longer than other British ships and suffered heavy casualties. The casualty figure for HMS Monarch came to 36 dead and 100 wounded. The British victory at Camperdown was overwhelming. The Dutch fleet had been convincingly defeated within sight of their own shoreline. The next time the British and Dutch fleets confronted each other, in the 1799 Vlieter Incident, the Dutch sailors refused to fight and surrendered en masse. The Battle of Camperdown, 11th October 1797. After the Battle of Camperdown, Captain O'Bryen was replaced in command by Captain Samuel Sutton. He remained in command until May 1799, when he was replaced by Captain Sir Archibald Dixon. Dixon remained in command until he was promoted to Rear-Admiral the following month. In the meantime, HMS Monarch remained in the North Sea, on blockade duty off the Dutch coast. On Captain Dixon's promotion, HMS Monarch received a new commander, Captain James Mosse. In early 1801, HMS Monarch joined a fleet under the command of Admiral Sir Hyde Parker sent to neutralise the Danish fleet and fortifications at Copenhagen as part of the campaign to break up the League of Armed Neutrality set up by Tzar Paul of Russia. This also included the fleets of Russia and Sweden and when combined, would mean the British would face an additional enemy with up to 123 ships of the line in addition to the combined fleets of Spain, France and Holland. HMS Monarch joined the attack squadron commanded by Nelson, flying his flag in the 74 gun 3rd rate HMS Elephant. The Danish fleet consisted of 24 ships of the line, anchored off the fortifications of Copenhagen and Nelson and his force of 12 ships of the line were required to neutralise these before troops could be landed to assault the fortifications. In the morning of the 2nd April 1801, Nelson's force made its way slowly up the Skaw, but suffered losses when first, the 64 gun ship HMS Agamemnon, then the 74 gun ships HMS Bellona and HMS Russell ran aground. Battle was joined at 10:05 when the Danish shore batteries opened fire. In July 1801, Captain Mosse was replaced in command of HMS Monarch by Captain Thomas Peyton. In August 1801, HMS Monarch was at Chatham having the damage sustained at Copenhagen made good. On 25th March 1802, the war was ended by the Treaty of Amiens. The peace proved to be short lived and war broke out again in May 1803. In July 1803, HMS Monarch was fitted for sea at Chatham in July 1803. She recommissioned under Captain John Searle. She was repaired again at Chatham between September 1805 and April 1806. Captain Searle was replaced in command in July 1806 by Captain Richard Lee. He would be her final commander. On 25th September 1806, HMS Monarch was part of a squadron of six ships of the line under Commodore Sir Samuel Hood (younger cousin of the more famous Sir Samuel, Lord Hood), flying his command pennant in HMS Centaur (74) which was patrolling off Rochefort. 5 of the squadron were 74 gun third rate ships and one was the 98 gun 2nd rate ship of the line HMS Windsor Castle. HMS Monarch sighted 7 strange sails and was ordered by the flagship to give chase. The strangers were quicky identified as being a French squadron of five heavy frigates, four of which carried 40 or more guns. HMS Monarch quickly bore up to the first of the French ships, the 40 gun frigate Armide. HMS Monarch opened fire with her bow guns. BY 10am, HMS Monarch was within range of the entire French force and engaged the French frigates Armide, Gloire (44) and Minerve (36). The three French frigates assumed positions where they could offer mutually supporting fire and a very heavy exchange of fire then ensued between HMS Monarch and the three French frigates. HMS Monarch was at a significant disadvantage because the state of the sea was such that she could not open her lower gundeck gunports. She was being outgunned by the French and was suffering damage as a result. 20 minutes into the firefight, she was virtually unmanageable, such was the damage to her spars and rigging. Luckily, by this time, HMS Centaur had closed the range sufficiently to engage the Gloire and the Armide, leaving HMS Monarch to deal with the Minerve. At 11:45, Armide surrendered to HMS Centaur and Minerve surrendered to HMS Monarch shortly afterward. HMS Monarch's casualties came to Mr Midshipman William Buddin and three seamen killed, with Lieutenant Anderson, Mr Peter Duffy (Boatswain), Mr Midshipman John Geary, 15 seamen and seven marines wounded. In November 1807, France and Spain invaded British ally Portugal, starting what is now known as the Peninsular War. HMS Monarch was immediately sent to Lisbon. On 29th November, HMS Monarch was part of the escorting force for a fleet of 23 Portugese warships and 31 merchant vessels carrying the entire Royal Family, Court and Government of Portugal to Rio de Janiero in Brazil to form a Government in Exile. This was a major blow to the French and their Spanish allies, as it enabled the Portugese to govern their empire intact from Brazil. 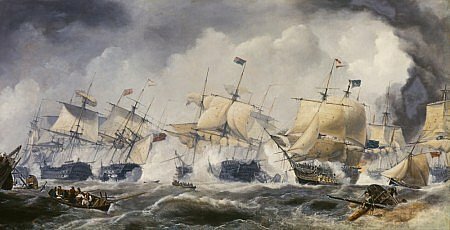 In July 1809, HMS MOnarch took part in the unsuccessful Walcheren Campaign where a marshy island in the Scheldt Estuary was invaded by elements of the British Army. By the beginning of 1812, the naval element of the post-Revolution wars against the French was pretty much over. The French navy had pretty much ceased to be an effective fighting force. The navies of the Netherlands, Spain and Denmark had been neutralised. The coming war with the USA was to be fought with smaller ships and the Royal Navy had taken delivery of a large number of more modern ships of the line. In early 1812, HMS Monarch paid off for the last time at Chatham. Her age and condition precluded further use as a front-line combat unit. In 1813, HMS Monarch was taken into the Royal Dockyard at Chatham and was broken up.